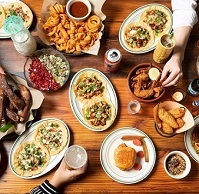 Lively bar food is what you will find at Al Pastor, Chef Alex Stupak's casual dining experience that mashes Mexican-inspired cuisine with "booze absorbing Americana." On the menu, look for everything from broiled oysters with hoja santa and bacon to pork fried rice and baby back rib carnitas with salsa verde. Middle Eastern influences can also be found in dishes like kibbeh with labneh and pine nuts; and hummus with cucumbers and za’atar. Margaritas, beer and shots are the drinks of choice along with "tiki" cocktails like the Mutineer (Charanda Uruapan Rum, Canela, Pink Grapefruit) and the Scorpion Bowl (Reposado Tequila, Mezcal, Fresh Pineapple, Citrus (serves two)). The space has a "pubby" feel with murals by Jeff Soto, a private dining room, lounge and game room. Al Pastor will also operate a rooftop bar on the 17th floor of the POD 39 hotel.